The type of builder you will be looking for depends on the area you live in, and the home you want. 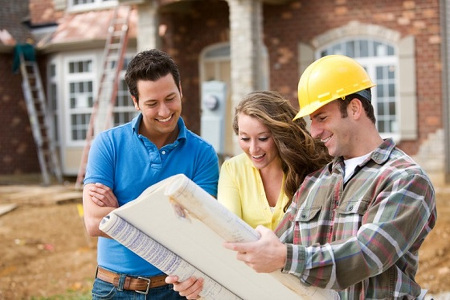 Here is a general overview of different types of home building companies. Developers are responsible for getting large tracts of land ready for building. This can involve infrastructure and services (utilities, roads, sewers), community layout and design, including recreational spaces — whatever it takes to turn the land into a neighbourhood. Developers may also construct the homes, or the lots may be sold to individual home building companies. Large building companies specialize in building homes in bigger developments. These companies offer a selection of homes designed specifically for the development. Minor customization by homebuyers is usually permitted, but there are usually limits to the amount of change possible. Most will also have a set process for all aspects of the purchase, from the contract signing to the pre-delivery inspection. Medium-sized companies range from 10 to 50 homes a year, depending on your region. Medium companies can be quite diverse — building in developments as well as on individual lots; constructing single-family dwellings as well as townhouses and other low-rise buildings. Small-sized companies build under 10, and often less than five homes a year. Custom builders make one-of-a-kind homes, each one usually designed and constructed for a particular customer who may or may not already own the lot. The custom building process allows for complete flexibility, within the limits of municipal regulations and what’s possible technically. The construction contractor is another term for a builder. Most commonly, it is used for companies who are contracted by purchasers to build a home on land they already own. Manufactured housing builders construct homes in a factory and bring them to the building site as panels, modules or fully completed units. The amount of work required on-site to complete the home depends on the type and size of the building, the type of foundation and the customization required. Building a New Custom Home in Ontario New Building Practices – Home Builders Ontario The Cost of Home Building – Dreaming of Building a New Home, but Worried About the Expense? Home Builders in Ontario – Building Dreams One Home At The Time!